Chicken strips are an easy addition to a salad, wrap, sandwich or just to dip in a sauce! Thinly sliced chicken breasts are breaded with seasoned flour and quickly fried to a golden brown. I like to serve a big salad for dinner and I have found that adding protein to the salad helps us to feel full longer. Lately I've been frying up chicken strips for salads and we love them! 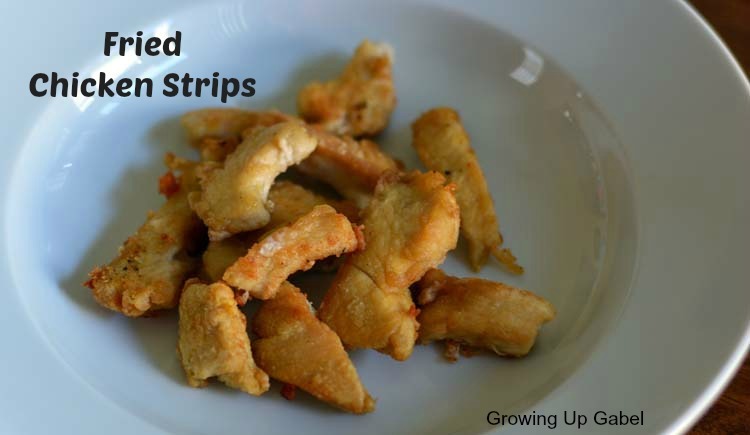 I have avoided making “chicken fingers” or “chicken nuggets” because usually my kids just wouldn't eat them since they weren't overly-processed and they usually take a lot of work to make But these strips are quick and the kids gobble them up. I learned quickly to make twice as many as I needed for the salad. In a large bowl that has a cover, combine flour and seasonings. Whisk to combine. Slice chicken breasts in to 1" strips, slicing as thinly as possible. It helps to leave the chicken just a tiny bit frozen. Put 1/3 of the chicken breast strips in to the bowl. Cover and shake. Put another 1/3 of chicken in to bowl (leaving the covered chicken in there). Cover and shake. Put remaining chicken in bowl (leaving the covered chicken in). Cover and shake. Fry chicken strips (in batches if needed).